New Jersey companies that want to improve their employees’ skill sets in specific areas can do so under a new round of funding for the NJBIA Basic Skills Workforce Training Program. The NJ Department of Labor and Workforce Development recently awarded an additional $1.2 million for the program’s current fiscal year. The training is provided free of tuition costs for both employers and their employees. The program also has been expanded to include more course offerings. Training in PC data bases, problem solving, team building and leadership, time management, supervisory skills, and Spanish in the workplace I & II have been added to the program’s curricula. 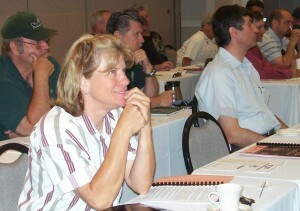 An employee in training listens to an instructor. Basic Skills training is customized to meet the specific needs of companies and their employees. The program continues to offer training in PC skills (Microsoft OS, Word, Outlook, Excel and PowerPoint), communications (written, verbal and customer service), English as a second language, and mathematics & measurement. In the program’s first full eight years, ending June 30, 2015, more than 85,000 employees with about 5,000 individual employers received training services. In the current fiscal year, the NJ Community College Consortium that manages the program expects to come very close to reaching 100,000 people trained. Instruction is delivered through the state’s community colleges by seasoned adjunct professors with experience in providing instruction to the business community. The training is customized to fit the particular needs of each participating company. Many of the teachers have deep business experience to offer, as well. Melanie Willoughby, chief government affairs officer with the New Jersey Business & Industry Association, which co-founded the program in partnership with the Consortium, said the initiative grew out of a real need among the state’s employers, identified in several surveys, to upgrade their employees’ skills to keep up with technological advances and industry trends. The program is funded with grants provided by the NJ Department of Labor and Workforce Development, which has been a strong advocate of the program with the blessing of the State Legislature, which has provided for a stream of dedicated funding. This story originally appeared in the February 2016 issue of New Jersey Business, the magazine of the New Jersey Business & Industry Association. The author is Christopher Biddle, President of Biddle Communications & Public Relations.